Custom Events are events that happen only when you tell them to happen. Why would you want to do this? Reuse Logic. If you're finding that you're copying and pasting the same code, you could stick it into a Custom Event and trigger that Custom Event instead. Allow other behaviors to cause stuff to happen. Aside: In programming terms, Custom Events are equivalent to the concept of "messaging" or "indirect invocation" - they aren't quite the same as function calls since you aren't always specifying a receiver. There can be as few as 0 receivers or infinitely many. 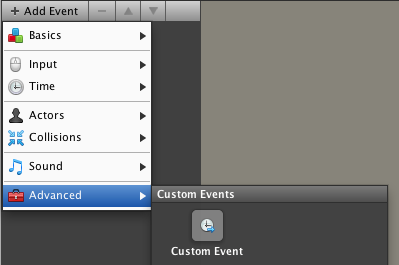 Inside the Behavior Designer, go to Add Event > Advanced > Custom Event. Type something into the blank. This is the text that will cause this Custom Event to trigger. That's it! Now fill out what you want to happen inside the event. Custom Events are triggered by any one of the blocks under Behavior > Triggers. The act of telling a Custom Event to happen is called triggering. To trigger an event, put in the text you stuck into the blank when defining the event. You can specify exactly which behavior you're targeting. You specify no target, so it attempts to trigger the event for all behaviors for a particular Actor or Scene. Note: If a behavior doesn't have a Custom Event and you try to trigger it, nothing happens. It's ignored. When would specifying no target ("all behaviors") be useful? A bunch of behaviors happen to receive the same event, and you want to target them all at once. You don't feel like typing in the target behavior, so you target them all. Besides a minor performance penalty, there's nothing wrong with this. Sometimes, you may want to make a Custom Event configurable. Which is say that you would want to stick a Text Attribute into the blank. You can do this, and as you'd expect, the text for Custom Event becomes configurable. Warning: Do not change the value of the Text Attribute at runtime during the game. The Custom Event may break if you do this. Custom Events and Custom Blocks overlap somewhat in use case. However, they differ in several respects, as summarized below. Can be indirectly or directly triggered. Easier to setup and use. More difficult to setup but more versatile in some respects. Custom Events are events that you trigger yourself. You define the text that triggers the event. Generally speaking, it's easier and simpler to just target all behaviors rather than specifying a specific recipient. The major difference you might notice about events and functions is that an event is what activates one or multiple functions. Its a very descriptive name. It's an event. Something happened, a button click for instance. But you now want to respond to that. So is it like a function in python?